You've no doubt seen the Batman v Superman teaser trailer. If not, here's a look at it. There's a lot going on in this trailer so let's take a closer look at it. The trailer starts with various people, journalists, pundits, scientists talking about Superman. Here's a breakdown of what I can discern from this narration. It sounds like talk show host & journalist Charlie Rose is asking, "Is it really surprising that the most powerful man in the world should be a figure of controversy?" The opening shot of the trailer reveals a mostly rebuilt Metropolis and zooms in on a statue of Superman. Seriously? They built a statue for him already? Who do they think he is, Rocky? Another voice I can't identify posits, "We as a population on this planet have been looking for a savior." All while this group of people, along with the Cobra Kai guys in their Halloween makeup in the background reach out to their savior. Renowned astrophysicist Neil deGrasse Tyson says, "We're talking about a being/alien whose very existence challenges our own sense of priority in the universe." Another voice I can't identify says, "Human beings have a horrible track record of following people of great power." While Superman is carrying/rescuing a Russian space rocket which is reminiscent of the iconic cover of Action Comics #1. It sounds a lot like Holly Hunter in an unspecified role saying, "Power corrupts, and absolute power corrupts absolutely." Well, she isn't wrong. These soldiers who have the Superman insignia on their shoulders kneel before their god. An unidentified voice tries to defend Superman by saying, "Maybe he's just a guy trying to do the right thing." I'm pretty sure it's Jesse Eisenberg as Lex Luthor saying, "Now we know better now, don't we? Devils don't come from hell beneath us." And right on cue as Superman is floating messianically in the sky a voice answers, "No, they come from the sky." Another voice makes the point, "They brought their war here." And Holly Hunter again wonders, "The world has been so caught up with what he can do, that no one has asked what he should do." Sounds like something Jeff Goldblum would say. The pan in to the Superman statue reveals "False God" painted on his chest, all while an angry mob are chanting "Go Home!" And then Jeremy Irons as Bruce Wayne's butler Alfred chimes in, "That's how it starts." Alfred continues "The fever. The rage. The feeling of powerlessness." While we get our first shot of Ben Affleck brooding as Bruce Wayne. "That turns good men, cruel." It sounds like Alfred is referring to Bruce, and possibly how pissed he is that these super-powered aliens came, basically destroyed a city, and changed everything. Here's Batman, possibly in the ruins of Wayne Manor? and starts firing on a shipping container yard. Possibly clearing a path for the armored Batmobile. A ridiculously buff Batman emerges from some rubble. Batman atop a skyscraper is a pretty iconic image. The big twist here is he appears to have a rifle with a scope. 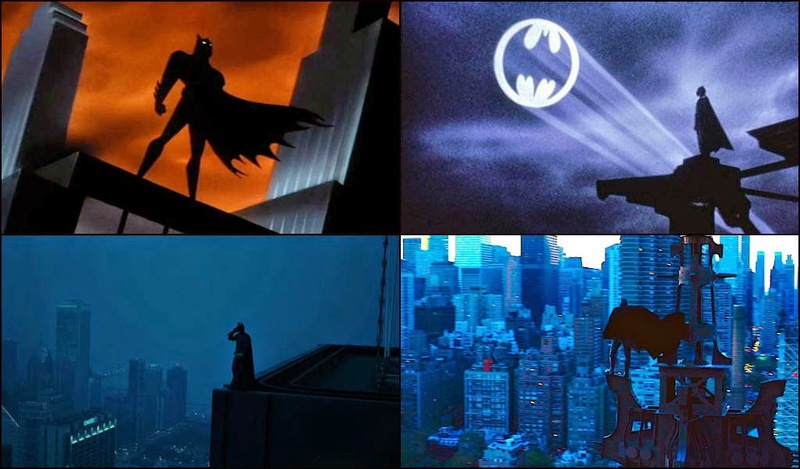 And here's some of the Batman on skyscrapers imagery from past movies and TV. A nice, clear shot of the armored Batman suit looks a lot like the one from Frank Miller's The Dark Knight Returns. And asks, "Tell me. Do you bleed?" Superman makes a dramatic landing, and Batman answers himself with, "You will."